At my father’s behest, I got around to seeing Lenin’s Mausoleum. 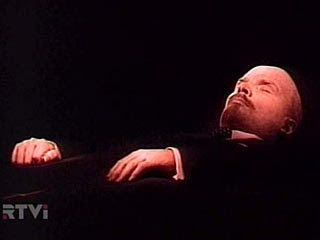 For reasons unbeknownst to me, Lenin’s tomb is a big attraction. International crowds line up early in the morning, in a quite a long line, give up all of their recording devices like cameras and smart phones, and go through a metal detector. Once the security check is complete, there is a long procession that takes the visitors by the graves of many Soviet heroes, including Khrushchev and Stalin. Finally, one arrives at the door of the mausoleum and is greeted by strict and formally dressed military officers. Curious foreigners chat amongst themselves. They are repeatedly reminded that this is a dead man’s resting place, and hence respect and silence is warranted. As the visitors were hushed by the guards, my father, being hard of hearing, kept asking in a loud voice what the guards said after they told him to hush. The guards would then hush my dad some more; and that was followed by my dad even more quizzically asking again what the guards said. 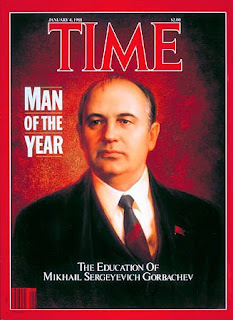 After going through a winding subterranean hallway, once gets to see Lenin. After a 270 degree tour of the dead man - or a replica - lying in state, one starts to climb stairs and emerges from the underground lair. Overall, it was an unsettling experience for a number of reasons. 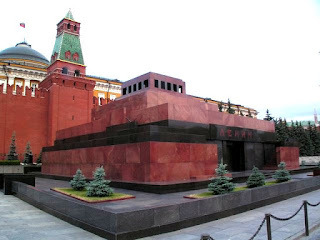 First, the mausoleum creates a cult of personality around Lenin, where – whether you appreciate or agree with them – Lenin’s ideas are what should be discussed. Second, the mausoleum seemed like a house of worship. This is an extension of the personality cult criticism, but there was something rather church-like about the experience that left an eerie feeling. Third, this mausoleum is a historical anachronism in 2010. Russia is capitalism’s new frontier; its markets are generally unregulated and near the polar opposite of communism. I do not understand how a tourist attraction can be built around a dead man but, evidently, it can; and tourists come flocking from the earth's four corners despite the oddness of the display. IMHO: Destroying the Orthodox Church, they substituted it and its influence with things that looked so usual: May-Day or 7 Nov demonstrations instead of Crucessions, leader portraits instead of icons, Lenin's corpse instead of remains of the saints etc. That's why it looks so religiously. The Weather Is ... HOT! Passage for the Pure: No "Buggy Features"